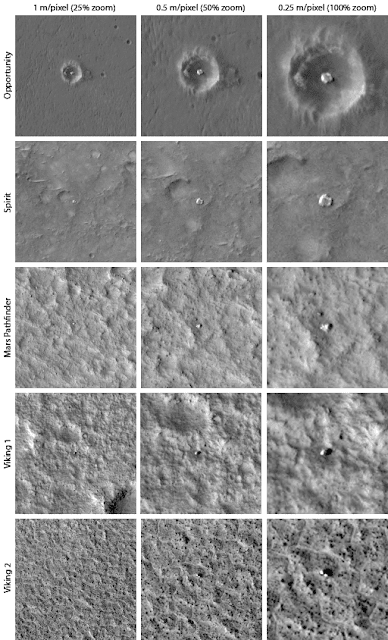 Today we're going to take a look at 15 different images of Mars taken by the Mars Reconnaissance Orbiter's HiRISE camera. These images show the parachute and backshell of the six successful Mars Landers: Viking I, Viking 2, Mars Pathfinder, Spirit, Opportunity, and Phoenix. It is easy to spot these landers and their associated hardware because we know exactly where they landed. We still haven't been able to find the failed landers, Mars 2, Mars 3, Mars 6, Beagle 2, and Mars Polar Lander, despite extensive searching. Finding the failed landers is much harder because we don't know where they land and we have to guess according to their last known positions as they approached Mars. When trying to identify a lander the easiest things to identify are the parachute and the large protective backshell. As you can see from most the of the below images, the parachute is the easiest thing to see. The lander itself is relatively small and hard to see. All but one (Mars 2) of the lost landers are believed to have deployed their parachute so they should theoretically be visible if in an area imaged by HiRISE. Clicking on this image will take you to the original article from the Planetary Society about finding Mars landers.